For the man who won't settle for less. Ultimate expression of touring elegance. 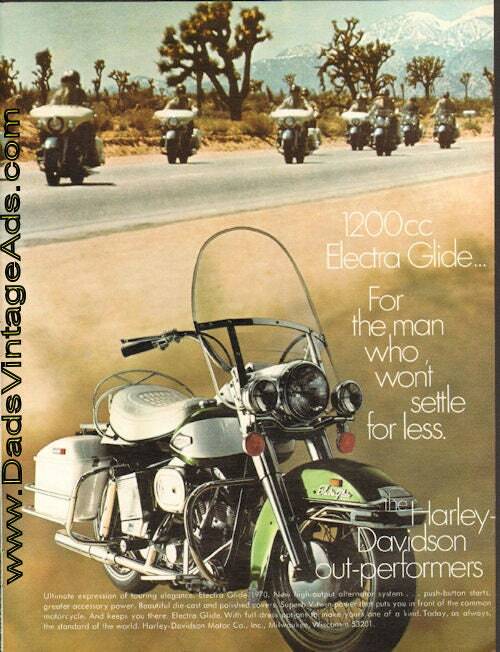 Electra Glide 1970. New high-output alternator system...push-button starts, greater accessory power. Beautiful die-cast and polished covers. Superb V-twin power that puts you in front of the common motorcycle. And keeps you there. Electra Glide. With full-dress options to make yours one of a kind. Today, as always, the standard of the world. Harley-Davidson Motor Co. Size: Approx. 8 1/4" x 10 3/4" (21 cm x 27cm).